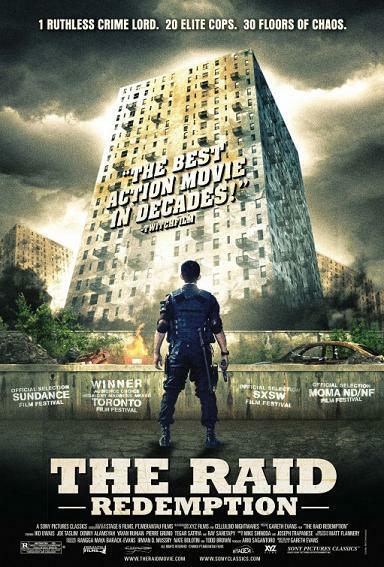 "The Raid: Redemption" knows what it is and stays focused to do all its best to stay in that path. What we get is one jaw-dropping action experience that we rarely experience in this day and age of CGI. This is a tribute to old-school martial arts films with its elaborate, stunning and frenetic choreography. Problem is, the film totally forgets to develop a story and more so compelling, deep and interesting characters. But for action fans, this is one of the best to come out from the genre in recent years. Not only in the Asian scene but the globally as well. It's fresh, creative and has a unqiue style of its own. For years, the criminal underground has been ruled by Tama Riyadi (Ray Sahetapy). Tama has been doing his operations in a rundown apartment complex which his rivals and police have been unable to penetrate. Seargent Jaka (Joe Taslim) is leading his 20-man SWAT team on a secret mission to raid and stop Tama. Also with him is Rama (Iko Uwais), a rookie SWAT member, and Lieutenant Wahyu (Pierre Gruno), who has commission the mission. Everything goes smoothly until they reach the sixth floor when Tama is alerted of the team's presence. Now, Jaka, Rama, Wahyu and the others must find a way to fend off the Tama and the residents who are out to kill them all. "The Raid: Redemption" delivers beyond its promise of non-stop action. In fact, it crushed all of our expectations by leaps and bounds. The biggest asset of the film is of course its action sequences. What's amazing is not only the choreography but the elaborate camera angles and shots that were used. It was almost flawless from start to finish and it is amazing how perfectly they did this considering how many fight scenes were in the film (and they were even more than a couple of minutes long most of the time). As for the story, it left us wanting more. Maybe things got lost in translation but it was too simple and cliché for our taste. The same can be told for the characters. The acting was good enough but the actor themselves can only do so much with limited time and material. In the end, "The Raid: Redemption" is a purely action flick and nothing more. Actually, that's not a bad thing - it's actually the same trait that makes it oh so good and memorable.